The Piedmont Environmental Council (PEC) and Virginia Department of Transportation are collaborating to reconnect brook trout habitat and improve flood resiliency and public road-stream crossings in two more locations in Rappahannock County. This past month, the PEC received a $199,057 grant from the National Fish and Wildlife Foundation Chesapeake Bay Stewardship Fund to partner with VDOT on two pilot fish passage and flood resiliency projects near Sperryville and Chester Gap. “Both streams are classified Class II Wild Trout Streams by Virginia Department of Game and Inland Fisheries (DGIF) and have intact yet fragmented brook trout populations,” notes Claire Catlett, Rappahannock Field Representative for the PEC. Headwater streams in the Blue Ridge Mountains form rare intact habitat for the American eel and Eastern Brook Trout, Virginia’s state fish. However, a 2014 survey by PEC and the U.S. Fish and Wildlife Service found restrictive culverts to be a key limiting factor in restoring eastern brook trout populations in this county and elsewhere in the Piedmont. Restrictive culverts are also much more vulnerable to intense storms, causing road closures, property damage, and flooding. By opening the streambed to its natural width, the new open-span structures will be much more resilient in the face of intense weather events, improving safety for travelers and saving taxpayers money. The projects in Sperryville and Chester Gap will take place this year. A little over a year ago, the PEC celebrated the completion of the Sprucepine Branch restoration project, also near Huntly, with partners and local residents. That effort was one of the first of its kind in Virginia’s Piedmont. The work at Sprucepine Branch reconnected two miles of stream habitat, as a set of culverts were removed from a private driveway and replaced with a bridge. The project included natural channel design and construction, which was completed by the U.S. Fish and Wildlife Service and Shenandoah Streamworks. The work included re-grading stream banks and in-stream structures that restored the natural hydrology of those streams. According to the state fish and game department, over 400 streams or portions of streams in Virginia contain brook trout. Many of the streams and ponds in adjacent Shenandoah National Park and nearby George Washington and Jefferson National Forests have “native” brook trout. 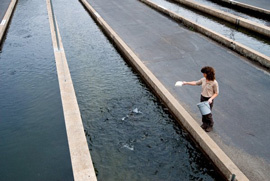 Trout stocking at Conaway Run Lake in Tyler County has been suspended until repair work to the dam is completed, the Division of Natural Resources announced on Wednesday. Adverse weather conditions have delayed the needed dam repair work at this facility. After decades of near-neglect, West Virginia’s trout hatcheries are getting repairs and upgrades that should help them produce more and bigger fish. Some of the work is already done, some is underway, and some is still in the planning stages. One of the key projects, a major expansion of the Bowden Hatchery, could get started as early as this summer. West Virginia’s trout stocking season is now underway, giving anglers and their families several opportunities to enjoy this exciting outdoor pastime. During the season, which runs through May 31, the West Virginia Division of Natural Resources will stock lakes and streams around the state each week. A list of stocked waters and the frequency of stocking may be found in the new Fishing Regulations Summary, which also lists regulation changes for this year. Copies are now available at license agents, DNR District Offices and online at www.wvdnr.gov. Anglers can call the Fishing Hotline at 304-558-3399 or visit DNR’s website to find out which streams and lakes have been stocked each day. Before casting their line, anglers must have a 2019 fishing license, which can be purchased online at www.wvfish.com, by calling the licensing unit at (304) 558-2758 or at license agents around the state. Beginning in March, the stocking schedule will shift to Tuesday through Saturday, said DNR Fisheries Supervisor Jim Hedrick. Currently, the stocking schedule is Monday through Friday. Anglers are encouraged to access DNR’s online interactive map which provides valuable information about fishing adventures in the Mountain State. The map contains information about which streams and lakes are stocked, special fishing regulation areas and driving directions to those waters. The interactive map has been upgraded to include information about lake depths, real-time stream flows and allows for maps to be downloaded for offline use or for printing. Tennessee's winter trout stocking program has resumed as the new year begins and will continue at selected locations through the middle portion of March. The 2018-19 program began in December. The program provides numerous close to home trout fishing opportunities for anglers during the winter months. These fisheries also provide a great opportunity to introduce children or first-time anglers to fishing. The trout will average about 10 inches in length. The daily creel limit is seven, but there is no size limit. Anglers are reminded that a trout license is needed in addition to the fishing license. “ As many of you know, we stock trout from both State and Federal Facilities. Those include the Spring River State Fish Hatchery (owned by us, the AR Game and Fish Commission) and three US Fish and Wildlife Service Hatcheries (Norfork, Greers Ferry, and Mammoth Springs). All four facilities are equally important when it comes to stocking fish across the state and stocking is definitely a collaborative effort between all parties. This year, the federal facilities will supply about 57% of the trout stocked in the state, whereas AGFC will stock the rest. Some tailwaters (e.g., Greers Ferry, Norfork, and Beaver) rely 100% on stockings from the federal facilities, whereas others, like Bull Shoals Tailwater, are stocked by both state and federal facilities. Hopefully, that gives you an idea of the importance that both agencies have to trout stocking in AR. “That being said, the shutdown has resulted in a limited capacity for the federal hatcheries to complete their work. It is my understanding that they are working with skeleton crews to feed fish and perform other necessary daily activities at the hatcheries. While this is ongoing, stocking from the federal facilities will occur on a very limited basis in most areas. That may mean that certain areas get no fish at all, or that stocking will occur less frequently. AGFC personnel have already reached out to the federal facilities and we have offered to help them haul fish as much as we can. In fact today, Spring River personnel hauled fish that were supposed to be stocked by Norfork Hatchery. “Later this week, AGFC will hauling fish from Norfork to the Beaver Tailwater. It's possible that the other two facilities may request help as well. Our Spring River Hatchery folks, under the guidance of Melissa Jones, are an exceptional crew and I am confident that they will continue to do everything they can to help out our federal partners. Although I understand that this may be very concerning to some folks, I assure you that we are going to do our very best to limit the impacts this situation could have on your angling trips. Once the shutdown is over, any fish that were not stocked will be stocked ASAP and the numbers will be caught up to date. As needed, AGFC will also continue to help our partners during that time. “It is not my preference or desire to engage in a political debate about this shutdown. If you have concerns, my recommendation would be for you to call your respective Federal Congressional office to express those concerns and how this could affect your livelihood and/or recreational opportunities. Please let me know if you have any questions. I'll do my best to answer them. 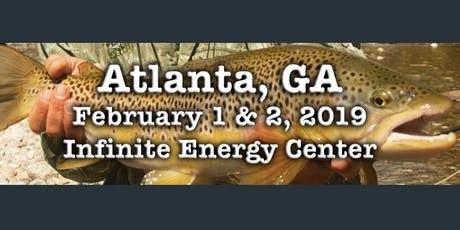 Join the fun at the third annual Atlanta Fly Fishing Show February 1 & 2, 2019 at the Infinite Energy Center in nearby Duluth, GA. Continuous talks, demonstrations, seminars and fly-fishing displays. Your admission gives you access to all exhibitors and fly tiers on the show floor, casting demos and instruction on the pond, Destination Theater, Featured Fly Tiers, and Author's Booth. Also Friday 4:30 Southern Trout Magazine is conducting it 3td Legends of the Fly Hall of Induction. Sweetwater Brewing Company will be on hand with samples of their new Guides Ale. And the indomitable John Reinhardt will be the master of ceremony. The International Fly Fishing Film Festival. One night only, Friday, February 1, 2019, at 6:30 pm. Tickets are $15 at the door or $10 in advance. Don’t miss our special musical guest Dave Blackburn. He will be playing for a feature “happy hour” act prior to the screening of the International Fly Fishing Film Festival. Fly Fishers Learning Center. Fly Fishers International (FFI) hosts the Fly Fishing Learning Center with fly tying, casting instruction and other fly fishing information and is free to show attendees. The FFI Learning Center is a good place to advance the skills of all fly fishers. Stop by and get acquainted! • New 2019 products from manufacturers. • Programs and learning opportunities for youngsters and families. • Casting demos and instruction with Gary Borger Kevin Howell and more! • Fly tying with Dave Whitlock, Ed Engle, Tim Flagler and more! saving show specials and destination seminars. 6:30 featuring award-winning fly-fishing films. • Two casting ponds for rod testing. • A new Scouting merit badge program. • Live musical performances by Dave Blackburn. Gather your friends, family, and club members for the best show in town … and remember to bring the kids. Spend both days at the show to get the most of the event. You can’t see it all in a day. See you at the show! ﻿-Ben Furimsky and The Fly Fishing Show Family. Online balloting has been completed and closed, inductees into the 2019 Southern Trout “Legends of the Fly Hall of Fame announcement is now available. Those being installed February 1st at the Atlanta Fly Fishing have been informed and will be in attendance at the ceremony. They join the growing group of 18 anglers recognized for their significant contributions to the sport of trout fly fishing in the Southland. Eugene Shuler of Bryson City, North Carolina, is a lifelong fly fishing guide, and owner/operator of Fly Fishing the Smokies, the park’s largest guide service headquarters out of his fly shop in Bryson City. Shuler has also been a leader in making Bryson City the true trout fishing capital of North Carolina. Monte Seehorn of Gainesville, Georgia, is a lifelong fly fisherman, and former U.S. Forest Service coldwater fisheries director. Today he owns and operated a business that improves trout fishing in privately own waters such as Dukes Creek and the Soque River in North Georgia. The late Joe Manley of Gatlinburg, Tennessee was a book author and one of Tennessee’s most celebrated anglers in the 1930s through 1960.s He wrote the first book on fishing for trout in the Great Smoky Mountains National Park and served as an ambassador of Tennessee fishing. Chuck Kraft of Shenandoah, Virginia is a innovation of fly tier and rod designer. He first made his mark on the sport in 1960 when he developed the still wildly popular CK Nymph. He is widely recognized as one of the most innovative tiers in the Southland. The late Eddie George was from Knoxville, Tennessee where he was a leader in the lost fight to prevent TVA from destroying the brown trout fishing in the Little Tennessee River tailwaters below Chilhowie Dam. He was the innovator of the still poplar George Nymph. Don Kirk of Montevallo, Alabama is an East Tennessee native who wrote several books on the Great Smoky Mountain National Park. He is also the founder of Southern Trout, a digital magazine deducted to the promotion and preservation of the region’s fly fishing for trout. This year’s ST Legends of the Fly Hall of Fame induction has been expanded to recognize an organization that has had a significant impact on the region’s coldwater fisheries. This first recipient of this award is Sweetwater Brewing Company of Atlanta, Georgia. Since opening, it has dedicated considerable resources to saving and enhancing the Chattahoochee River trout fishery. As in years past, the master of ceremony will be John Rhinehart of Tennessee TU fame. His warm, witty presences bring emotion and laughter from the crowd. Despite the enormous cost of ST bringing is this high level of entertainment as Rhinehart, admission to the induction remain free. The Southern Trout Legends of the Fly Hall of Fame induction is scheduled for February 1st at the Atlanta Fly Fishing Show. Hydrilla, a highly invasive non-native plant, has been found in the Deep River, covering a 90-acre area in Moore, Chatham, and Lee counties. Is it a precursor of future problems on this piedmont river inhabited in its headwaters by brown and rainbow trout? Time may tell. As hydrilla is a really sticky wicket once it finds a home. The plant creates dense mats of stems and leaves on the water’s surface, crowding out native vegetation, making boating difficult and potentially harming fish, birds and aquatic organisms. Its impact can be significant both economically and ecologically, as treatment and control are expensive. N.C. Wildlife Resources Commission is asking people who boat, fish or swim in the river to help prevent the plant’s spread by cleaning all equipment of aquatic plants, animals and mud; draining water from boats, livewells, bait buckets, and other equipment; and drying all equipment thoroughly. The Wildlife Commission will work with N.C. Aquatic Weed Program, the U.S. Fish and Wildlife Service and other agencies and stakeholders to develop a management plan for hydrilla that will prevent its spread and address already infested areas. Learn more at www.ncwildlife.org/Fishing/ANS. Changes are in store for anglers who fish for West Virginia’s stocked trout. Beginning on the second week of March 2019, stockings will take place Tuesday through Saturday instead of Monday through Friday. Steve McDaniel, director of the state Division of Natural Resources, said the change has a simple goal — to attract more people to the pastime of trout fishing. Those stockings were announced in advance, and many of them took place in or near state parks. McDaniel said this year’s schedule will largely adhere to the same format. “We’ll announce some of the Saturday stockings to get people out there, mostly in and around state parks the first week of April during the Gold Rush,” he said. Every spring, the DNR makes between 800 and 900 stocking runs, most of them unannounced. McDaniel said anglers got advance notice for roughly 100 stockings last year, and he expects a similar number this year. Hunting and fishing are allowed under current law, and that current law is specifically preserved by Senator Capito’s bill. The current statute, adopted in 2009, states that the Secretary of the Interior shall allow hunting and fishing in the New River Gorge national river. Senator Capito’s bill includes specific language that says that the Secretary’s current obligation to allow hunting and fishing would remain in place for the newly designated New River Gorge national park. A push for a change in the designation of the New River Gorge from a National River Area to a full-fledged National Park seems to have little to no opposition as it moves in the United States Senate. U.S. Senator Shelley Moore Capito is the champion of the idea as a way to draw more attention from out of state tourists considering a vacation in the Mountain State. Advocates of the new designation argue it will draw more visitors to southern West Virginia to enjoy the river–particularly whitewater rafting. Perhaps they are correct, but it’s a gamble. Calling it a “park” may or may not be an added attraction. But one thing it will almost certainly do is significantly impact hunting and fishing within the boundaries of what is currently the New River Gorge National River and the Bluestone National Scenic River areas. For the time being, hunting is allowed in those areas. The Division of Natural Resources is also able to manage the fisheries. Several streams in the park boundary are stocked with trout and the agency of late has worked to restore the population of the native New River strain of walleye. Whether those activities would be allowed to continue in a National Park is unclear. When the area was declared a National River Area it was an effort led by the late U.S. Senator Robert C. Byrd. At the time, the area did not qualify as a National Park, so the designation of a National River was created. The enabling legislation stated hunting would remain one of the primary purposes of the land. However, every few years the master plan for the area must be revised. Hunting advocates have to be vigilant. Although the enabling legislation which led to the original designation included hunting as part of the park’s mission, the designation has been written out of the plan before. The move created a firestorm of controversy in the 1990s and the hunting language was restored. Trapping was banned in much the same way. Those monitoring the revisions assumed “trapping” fell under the heading of “hunting”, but under a federal definition, it did not. There is plenty of evidence the National Park Service isn’t a fan of hunting. More than a decade ago, in a study of wild and scenic rivers, the Park Service was able to take control of 3,000 acres of the Bluestone Wildlife Management Area lying along the banks of the Bluestone River. The WMA is leased by the DNR from the U.S. Army Corps of Engineers. Although a management agreement was struck between the Park Service and DNR, the relationship has always been contentious and management efforts on those 3,000 acres have been minimal due to the NPS objections. Sources within the DNR tell me the creation of wildlife openings and habitat diversification have all but ceased under Park Service oversight. While it’s true, there are some NPS managed lands across the nation where hunting is allowed, none of them are National Parks. All areas where hunting is allowed are some other designation, such as a National Preserve, National Seashore, National Recreation Area, or in the case of West Virginia a National River Area or a National Scenic River. When and if the New River Gorge becomes a National Park, it automatically falls under a whole new set of rules and guidelines. The Park Service typically carries a preservationist attitude rather than conservation. Therefore, hunting is almost universally opposed and the prospects for managing fishing opportunities could also be somewhat impacted negatively. So far there have been no announced public hearings on the proposed change. It’s also unclear if anybody has even bothered to check what the ramifications for sportsmen may be, but past history would certainly indicate West Virginia’s hunters and fishermen will probably be on the losing end of such a change. We at the Southern Trout family of magazine want to wish everyone a Merry Christmas. For seven years these magazines have been a labor of love that we’ve enjoyed bringing to you. We’ve been blessed and wish the same for you. God Blessed us by sending his only son, Jesus. Praise him. FAYETTEVILLE, N.C. (Dec. 11, 2018) – The N.C. Wildlife Resources Commission’s John E. Pechmann Fishing Education Center is offering five free fishing workshops for people of all ages and skill levels in January. Online registration is required for the workshops, which are open on a first-come, first-served basis. Jan. 5 – Level I Fly-Fishing Clinic from 9 a.m. to 3:00 p.m. Open to ages 13 and older. Students under 16 years old must be accompanied by an adult. Jan. 9 – Soft Plastic Lure Making Class from 6:30 p.m. to 8:30 p.m. Students under 16 years old must be accompanied by an adult. Jan. 12 – Basic Rod Building Course from 8:00 a.m. to 5:30 p.m. Open to ages 16 and older. Jan. 19 – Level I Fly-Fishing Clinic from 9 a.m. to 3:00 p.m. Open to ages 13 and older. Students under 16 years old must be accompanied by an adult. Jan. 24– Fly-tying Forum from 6:30 p.m. to 8:30 p.m. Open to ages 10 and older. Students 15 years old and under must be accompanied by an adult. The John E. Pechmann Fishing Education Center is located at 7489 Raeford Road in Fayetteville, across from Lake Rim. Commission staff at the Pechmann Center conducts fishing workshops, events and clinics throughout the year. Most programs are free and open to the public. For more information on the Commission’s wildlife education centers and other activities and events, visit ncwildlife.org/learning. The Clinch River Chapter of Trout Unlimited is again offering its Beginning Fly Tying course. This popular class fills up fast—and it’s a great Christmas gift. Guided one-on-one by experienced instructors, students will tie more than 50 flies as they learn nine different trout fly patterns that are effective in area tailwaters and in the mountains. Techniques learned will enable participants to tie many other fly patterns as well. The course is limited to a maximum of 12 students. Six classes are scheduled for Saturday mornings, 9 to noon, from Jan. 19 through Feb. 23, at St. Francis Episcopal Church, 158 W. Norris Road, Norris. Cost is $125 including an illustrated manual, all materials and, for newcomers, a free one-year membership to Trout Unlimited. Tools will be loaned free of charge to students who don’t have their own. Class proceeds benefit the Clinch River Chapter’s conservation and youth education projects. For more information or to sign up, contact Dave Harrell, tleo2008@live.com or (865) 803-4541. Little River Outfitter is proud to announce that two of the Smoky Mountains fly fishing “living legends” will be at the shop December 15th for a Free Event. They are of course, ST Hall of Fame member, Walter Babb and local long rod Jack Gregory. These guys have been fly fishing for most of their life in the Southern Appalachians. Their skills are legendary. Their willingness to share what they know is a blessing for us. Jack and Walter will be tying flies, and discussing fly fishing with you, simultaneously. Walter will be at one location in the shop with Jack at another. You can move around between the two, from 10 am until 2 pm. There will be chairs for your comfort. This event is free. All you have to do is show up. Walter learned to fly fish and tie flies as a youngster, following his father around the streams in the Cherokee National Forest. He and LRO owner Byron Begley became friends over twenty yars ago and the two ofthem developed our fly tying classes. Walter still teaches fly tying and fly fishing at the Little River Outfitters School. Walter also became a well known bamboo rod maker. He works full time making rods for customers at his shop in Sweetwater, Tennessee. Jack is a retired home builder. He and Begley became friends long ago, traveling and fishing together from Yellowstone to Florida. Jack’s family left Cades Cove when Great Smoky Mountains National Park was formed. He lives in Walland, near Townsend. You will see his family name at sites in the Park…Gregory Bald, Gregory Cave and Spence Field. Mike McConkey will be cooking and serving FREE pancakes. Two decades ago in West Virginia, hundreds of miles of streams ran barren, devoid of insects or fish. Today many of those streams have been brought back to life, resurrected by humble gray piles of limestone sand dumped strategically along their banks. It sounds like magic, but really it’s just chemistry. The sand in those piles is limestone, and when acid water touches it, a chemical reaction occurs. The limestone dissolves, and as it dissolves it neutralizes the acid. So far, yearly treatments with limestone sand have turned more than 300 lifeless miles of water into productive miles of water that support insects, crustaceans and fish. Perhaps the most profound change has taken place in the Cheat River system, where treatments have taken place since the late 1990s. DNR biologist Pete Zurbuch experimented with limestone-sand treatments on the upper tributaries of Randolph County’s Shavers Fork, a stream that couldn’t support trout year-round because of acid snowmelt. The treatments not only re-established trout fisheries on the tributaries, they restored year-round fishing to the main stem of Shavers Fork, as well. Subsequent treatments on other Shavers Fork tributaries re-established year-round trout fishing along the river’s entire 89-mile length. Over time, the effects extended even farther downstream into the Cheat River, helping to create a vibrant smallmouth-bass fishery in the river and in Cheat Lake. Officials had known since 1964 that the addition of limestone to acid-tainted waters could restore damaged fisheries.The early efforts centered on waterwheels loaded with limestone rocks. As the streams’ currents turned the waterwheels, the rocks tumbling inside the wheels ground each other down, releasing tiny grains of limestone into the water. The technique restored a brook-trout population to Randolph County’s Otter Creek in 1964, and that success resulted in the construction of similar stations on Dogway Fork of the Cranberry in 1989, on the North Fork of the Cranberry in 1994, and on Beaver Creek of the Blackwater River in 1985. The stations, while effective, proved costly to install, operate and maintain. In the search for less expensive alternatives, Zurbuch and his fellow DNR officials hit upon the limestone-sand method. Limestone-sand treatments require only two things: a dump truck filled with the sand, and a place to dump the stuff. Sometimes it gets dumped directly into the stream. More often, it gets dumped at the edge of the stream and onto one of its banks. The sand that falls into the water immediately gets swept up by the current, triggering the chemical reaction and immediately buffering the acid. What isn’t dissolved falls to the bottom in a grayish-white deposit. When the water rises, more of the pile gets swept into the stream and some of the sand deposited on the bottom gets kicked back up into the current. Gradually, the sand — and its acid-buffering effects — get transferred farther and farther downstream. Rebinski has discovered that the sand doesn’t even have to be dumped directly into the stream itself. On the Middle Fork of the Williams River, the stream’s location within the Cranberry Wilderness prevented access by any sort of motorized vehicle. Rebinski traced one tiny tributary of the Middle Fork to a ditch at the side of the nearby Highland Scenic Highway, just outside the wilderness boundary, and had a truckload of limestone sand dumped into the ditch. The experiment worked; the Middle Fork’s water chemistry improved, and the stream’s native brook-trout population returned. Rebinski has since employed the technique to restore other remote streams that lack direct road access. Most people think that limestone treatment restores streams to productivity because it neutralizes acid. Water is considered acidic when its pH is below 7.0, and alkaline when it is above 7.0. Each whole number in the pH scale represents a tenfold increase in acidity or alkalinity. For example, a stream with a pH of 5.0 is 10 times more acidic than a stream with a pH of 6.0. When limestone treatment lifts a stream’s pH from 4.5 to 6.5, it reduces the acidity a hundredfold, which greatly reduces stress on aquatic organisms. “When the pH of the stream rises to 6.0 or above, metals precipitate out of solution and fall to the stream bottom, where they’re no longer in contact with the gills of fish and aquatic insects,” Rebinski said. The calcium released from the limestone also acts as a nutrient that boosts the production of phytoplankton and zooplankton, tiny organisms that form the base of a stream’s food chain. According to the federal law commonly known as Stormwater Phase II, permits are required for stormwater discharges from Municipal Separate Storm Sewer Systems (MS4s) in urbanized areas and those additionally designated by the Department. The city of Mountain Home< Arkansas is currently completing its MS4 permit requirements and will begin implementing them in 2019. Urban stormwater can be a significant source ofwater pollution and public health concern, however not all stormwater is polluted. It can be a source of pollution but it is not the only one. As communities continue to grow and develop their local economies, they look for sustainable and effective approaches to reduce these existing and emerging sources of pollution. Because approximately 90% of the City of Mountain Home’s storm water runs into the White River, it is a significant contributor to the water quality of the White River. In addition, Hicks Creek, which M carries much of Mountain Home’s storm water, has been and is currently on the ADEQ’s 303d (impaired) list of water bodies. According to the EPA, “Polluted stormwater runoff is commonly transported through municipal separate storm sewer systems (MS4s), and then often discharged, untreated, into local water bodies. To prevent harmful pollutants from being washed or dumped into MS4s, cities are required to develop stormwater management programs (SWMPs). To prevent harmful pollutants from being washed or dumped into MS4s, cities are required to develop stormwater management programs (SWMPs). The SWMP describes the stormwater control practices that will be implemented consistent with permit requirements to minimize the discharge of pollutants from the sewer system. Part of the SWMP is creating public awareness through educational programs to reduce the amount of urban pollution. According to Arnold Knox, P.E. Director, City of Mountain Home Street Dept. “the City of Mountain Home will be very proactive towards implementation of our MS4, once we get it approv ed. The City realizes that the City and our environment are intertwined and what hurts our environment hurts us. We are always open to new ideas on outreach and enforcement, and would love input into our future progress. As the City of Mountain Home develops and implements its MS4 plans, Friends of the North Fork and White Rivers, NAFF, Trout Unlimited and other groups will all be able to help the City of Mountain Home in various ways to protect water resources and fishing. Kevin Howell and the DRO crew invite you to come fill your mugs and crank out some bugs this January and February. It's fly tying season at Davidson River Outfitters. Whether you are new to fly tying, looking to improve your skills, or just wanting to get out of the house and be social, we have an event for you. Intro to Fly Tying (Monday Evening Class, Jan. 7th, 14th, & 21st)- Three nights covering fly tying basics, along with a variety of patterns that work in our area. Intermediate Fly Tying (Monday Evening Class, February 4th, 11th, & 18th)- This class covers advanced techniques such as dubbing loops, articulated flies, and spinning deer hair. Intro to Fly Tying (Saturday Morning Class, Jan. 15th, 9:00am-1:00pm)- A coffee infused introduction to the world of fly tying. Ladies Fly Tying Class with Debbie Gillespie- Feb. 16( 9:00-1:00)- A women's only introductory fly tying class. Ecusta Brewing Tyin' and Lyin' with Landon Lipke- Monday nights starting Januray, 7th, right next door to the fly shop at Ecusta Brewing. Sip Finish Sundays with J.E.B. Hall at Wedge Brewing @ Foundation in Asheville's River Arts District- Each Sunday in January and February from 4:00pm-7:00pm. Specialty Classes: Southern Appalachian Flies w/ Kevin Howell, Tenkara Flies w/Landon Lipke, Midges w/ Jeff Furman. Call the shop for dates and availability. HHave you been curious about chasing the elusive "Wolf of the Water"? If you are like many of our local anglers, the the answer is yes. Muskies are one of the hottest species in the fly fishing world right now, and it turns out the French Broad River is home to a good number of them. Davidson River Outfitters offers Winter Musky trips to those anglers who are ready to put a dent in the 10,000 casts it takes to entice one of these toothy beasts to the end their line. We are booking both half, and full days, but we would recommend a half day excursion for those who have never tried it before. There are both fly and conventional tackle options as well, so don't hesitate to bring a non fly fishing buddy along for the ride. Full Day $500. Whether you are new to fly tying, looking to improve your skills, or just wanting to get out of the house and be social, we have an event for you. Christmas is just two weeks away! But don’t fret, we’ve got your last-minute gift needs covered. With the gift of trees, you don’t have to worry about sizes or shipping costs. For every $1 you give, we’ll plant one tree in honor of your recipient. It’s that easy. Gifts between $25 and $74 will be notified via email and all gifts at $25 and above will receive two issues of the NFF’s fantastic magazine, Your National Forests, delivered right to your recipient if you provide a current mailing address. Plus, for every gift of $75 or more, you have the option of an electronic announcement or a beautiful mailed card, notifying your recipient of the gift. It really couldn’t be easier. With a few clicks, your family, co-workers and friends will get the gift that keeps on giving – clean water, clean air and healthy wildlife habitat for generations to come. And your gift of trees is tax-deductible, helping you save money. What could be better? Give the gift of trees today. Tax yourself. You can be the Sally Fields of the woodlands. It's that time of year again for our Beginners Fly Tying Class. But this year, we pleased to announce that ASUMH has accepted our class as part of their Continuing Education program. This is a class for beginners to teach the basic principles of fly tying. Students will tie two each of two different flies at each class, all of which can be used on our local rivers. All tools and materials are provided by the North Arkansas Fly Fishers. A mentor will be available on a one-to-two or one-to-one basis. The class is taught by Tom Emerick. Tom as well as our mentors are members of NAFF in good standing, and have experience teaching the local Home School group, our annual Sowbug Roundup, Conclave/Fly Fishing Fair, and/or past Introduction to Fly Tying Classes. Most importantly, all are active fly fishermen/women with a minimum of twenty years experience in the sport, and on our local waters. These are well seasoned individuals who love the sport with a willingness to share their knowledge and experience. In addition, mentors are on hand to assist the students as they ty the subject fly. The class will be held on Mondays in January, 2019 from 6 to 8 pm, specifically January 7, 14, 21, & 28, and will be held in the Ozarks Regional Arts Council Conference Room at The Sheid. Class is $20.00, and includes a one year membership in NAFF. If you are interested in taking the class....or know someone who is, register on line with ASUMH at https://asumh.edu/services/community-education.html. Scroll down til you find our course, check the box, and a registration form will appear at the bottom of the page. Class is limited to the first 12 registrations.